The Liverpool pilot boatCharles Livingston, built in 1921, was lost on Saturday, 15th November, 1939. When the vessel ran aground Second Master/Pilot Ernest Bibby was in charge. The weather was bad and deteriorating. The situation was made worse due to the imposition of war conditions: the considerable dimming of the Bar Light and the channel buoys. Just after midnight, Second Master/Pilot Bibby lost sight of the Bar Light, the only means available for positioning the ship. Thus began the appalling events that ended in tragedy. With Pilot Bibby in charge, the ship ran aground near Ainsdale at 3.30 am. Unfortunately, signals were transmitted stating: ‘Ashore between Bar Light Vessel and Ormes Head,’ causing great confusion for the rescuers, as she was actually off Ainsdale beach. Four men managed to reach the shore, but it was more than ten hours before the last six survivors were taken off the grounded ship. Of the thirty three men on board, ten were saved, including Pilot Bibby. Twenty three drowned. Seven of them are buried here, in this cemetery. The Liverpool pilot boat Alfred H. Read was built in 1913. 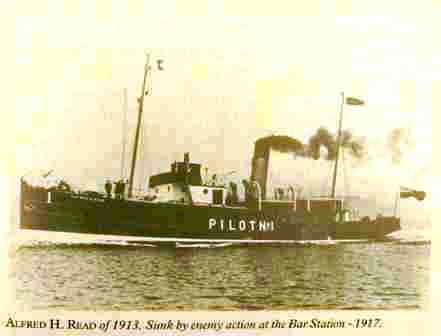 At the beginning of the First World War two of the pilot boats were taken over by the War Office for use as Examination Ships. In the early hours of 28th December, 1917, the s.s. Alfred H. Read struck a mine on the Bar station. She sank almost immediately. Of the forty-one men on board, only two were saved; nineteen pilots, eight apprentices and six crew members were lost, as well as six men employed by the Admiralty. At least seven victims of this disaster are buried at Rake Lane Cemetery. Cornelius Smith was an engine fitter at Cammell Lairds shipyard. He was one of the men lost on the submarine Thetis when she sank, in Liverpool Bay, in 1939. Many of the victims of this disaster were buried on Anglesey, but two men were brought back to Wallasey and interred in Rake Lane Cemetery. Close to Smith's grave is the headstone recording the loss of John Griffiths, also a Cammell Lairds engine fitter. There were 103 men on board. Only four men managed to escape.